Far Beyond Reality: I’m sure I speak for many readers when I say 2312 has been a highly anticipated novel. Can you introduce the book to us? What is it about, who are the characters, and what should we expect? 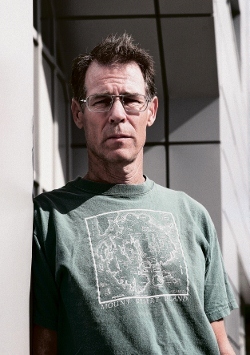 Kim Stanley Robinson: 2312 is a science fiction novel set in and around the year 2312. The project began for me with the idea of describing a relationship between a mercurial character from Mercury, and a saturnine character from Saturn, and proceeded from there. To accomplish that first goal I needed a solar system-wide human civilization, and this then drove the rest of the project, casting it out a long way into the future, long enough for there to be time for such a civilization to develop. After that I saw that I was in a zone that came roughly after the end of my Blue Mars, and without wanting to stick to the history described in my Mars trilogy (Mars in this novel has a slightly different history and is mostly off-stage), I did think it was an opportunity to extend my ideas of future history a little farther out. As this work unfolded, I realized that as happens in quite a few science fiction novels, the world itself became a major character, and what happened to my Swan and Wahram would be compelling partly in relation to how real or vivid their world felt. At the same time, three hundred years is a long time, and when you think about what we might be up to by then, it can be quite exciting, also daunting; it is sure to be a complex time, almost overwhelmingly diverse and strange. So I decided to try to convey that feeling, and eventually I came on the form of John Dos Passos’s great U.S.A. trilogy, which had been previously used also by John Brunner in his Stand On Zanzibar. This collage method, which combines a lot of different kinds of writing, is very adaptable, and very good at conveying a complex situation in an entertaining way. So, 2312 became a novel about Swan and Wahram and their acquaintances as they try to solve a mystery together, try to avert a danger to the solar system-wide civilization, actually a suite of dangers, which threaten an already complicated and unstable political situation. Their relationship remains at the heart of the novel, but it’s a historical novel too, with the public side of things also featured. Various speculations as to what humans might become, with our growing powers but our inherited huge problems, are included, I hope to a somewhat startling effect. It’s sure to be that way when things like longevity, gender complications, artificial intelligence and rapid terraforming are all thrown into the mix. Far Beyond Reality: Many of your fans will instantly recognize the setup of the city Terminator on Mercury and may be confused once they reach the point where the differences between Red/Green/Blue Mars and 2312 are revealed. Why did you decide not to place the novel in the continuity of your Mars trilogy? KSR: I have used the moving city Terminator on Mercury a few times, first in my novel The Memory of Whiteness, then in the story “Mercurial,” then in Blue Mars. None of these stories take place in the same history, but I like the idea of the city, and I like the idea of being on Mercury, surely one of the more dramatic planetary surfaces in our solar system. So I have recycled the use of Terminator as it keeps on rolling into my career. I didn’t want 2312 in the same future history as the Mars trilogy; on the contrary, I wanted to sketch out a different future history for the new novel. So the two have different particulars, and a different trajectory, and Mars in particular has a different history in the two. Partly this is because I like making up future histories for my novels, so merely to repeat or elaborate an already-existing history wouldn’t be as much fun. It’s more interesting to try something new, and by doing something new, I am not bound to anything I did before, at an earlier time and in the service of a different project. Starting fresh means the new future history can be designed to work specifically for the goals of the new novel. Also, if it is the case that when I’m making up my future histories I am genuinely trying to sketch out a course of events that feels as if it is the one “most likely to happen,” i.e. has a maximum plausibility, which is my working method in most of my science fiction novels, then what seemed “most likely” when I wrote the Mars books in the early 1990s, has since shifted a bit, and I definitely wanted to sketch out a new “most likely” that includes all that has happened in the last twenty years. I guess what this means is that I don’t really believe in the integrated future history model that some science fiction writers have used, in which many of their works fit into a larger future history they are sketching out. I don’t think the gains of such a project (a big macro story) outweigh the losses (flexibility over time and between books, and the chance to make more new things). FBR: The future history you’ve created in 2312 is incredibly complex, thanks to a number of political, economic, and even psychological dynamics. One of the most interesting elements is the Mondragon, which is based on a current corporate entity. What inspired you to use the Mondragon as such a prominent building block for this fictional universe? KSR: In various attempts to imagine future societies, I’ve looked into alternative economies existing in the world today, and one of the most interesting I’ve found is the city of Mondragon, Spain, which is a Basque town of about 60,000 people that runs as a kind of collection of nested co-operatives, including the bank, which is a kind of credit union. I’m using words that perhaps don’t exactly correspond to the realities there, but come as close as I can find to describing the situation. To a certain extent, the workers or citizens own the economic system there. So, commentaries on this economic set-up often remark on the stability of the population of the city, also the fact that they are relatively homogenous in ethnic and linguistic terms, and that this is the explanation for the success of their system. But I’ve often wondered if the success of the system has more to do with the economics they employ, and whether this system could be scaled up to larger populations. Then also, when I was in Antarctica, I noticed that the necessities of life were provided in a non-monetary system run by the National Science Foundation. I’ve often thought that the first space inhabitations might resemble the South Pole Station and also McMurdo, the bigger station or little town, on the Antarctic coast, on Ross Island. It seemed to me possible that space colonies might resemble that for long enough that it might get institutionalized, or at least seem like the normal or right way to do things. Then a certain path dependency would develop. In Antarctica there were still little shops selling extra little things people might want, and this gave me the notion of capitalism surviving “on the margins,” with the necessities provided on an as-needed basis. This is not exactly what is happening in Mondragon, but since I wanted a mixed economy anyway, or a mixture of different economies, including much more “horizontal” economies (shared work and value, non-hierarchical) it gave me my lead for what I developed as the spacer economics in 2312. FBR: You’ve written about the environmental collapse of Earth before, but in 2312 the contrast between life in the futuristic space environments and life on the damaged Earth is stronger than ever. It’s also highlighted by the occasional need for spacers to return to Earth for a “sabbatical.” Where did this concept of the sabbatical come from? KSR: I was thinking of how little we know about the long-term effects of humans living in low gravity environments, and also reading about the bad effects on the immune system of living in “over-sterile environments,” which is being studied now, to the point where some scientists have actually self-medicated with helminths (ringworm) to boost their immune system’s response. It added up to an intriguing possibility, which also seems quite likely to me, that we are “bubbles of Earth” and evolved to fit the specs of this planet, and only this planet, so that being off this planet would be bad for our health, maybe even in ways we couldn’t specify but only see the results of, i.e., inexplicable early death rates, despite successes in longevity. So all that added up to the idea of the sabbatical, that people living in space would need to return to Earth to give their bodies and minds a restorative dose of home, before going back out again. Even people who much preferred their space homes to old Earth might do it, just for the sake of increased longevity and health. This not only seemed likely in physiological terms, but was also a good way of pointing out that Earth will always be central to the human story, no matter where else some of us might go. FBR: From the loving way Wahram speaks about classical music, I get the idea that you may be a fan yourself. Would you like to suggest some pieces, or even specific renditions of the ones mentioned in 2312, as a playlist while reading the novel? KSR: My character Wahram is a big fan of Beethoven and some of the composers who followed him, and he and Swan whistle a lot of pieces together in the course of the novel. These include Beethoven’s symphonies, particularly from the third symphony on to the ninth (minus the eighth), and the late string quartets (which admittedly are much harder to whistle). Also very important to Wahram are Brahms’ four symphonies, and the last three of Tchaikovski. Later, when they are floating in space, Wahram also includes for Swan’s listening the cello suites of Bach, and the piano music of Debussy. And while Swan is taking her space elevator rides to get up and down from Earth to space and back, she attends multiple performances of Philip Glass’s opera Satyagraha. All of these might work as a kind of soundtrack for a reading of 2312, as they often served as soundtrack for writing it. In particular I guess I would recommend the fourth symphonies of Brahms and Tchaikovski, and the late string quartets of Beethoven, and Satyagraha. There are so many good versions of these pieces (except for Satyagraha, which I think has only one), that there is no reason to suggest any particular version. I think the first recorded version people get familiar with always seems most right to them, in a process I call “duck imprinting” (supposedly ducklings think the first thing they see is mamma). Many people already have their duck imprintings for these famous pieces. I will say that of the many versions of Beethoven’s late quartets that I have heard, I keep coming back to the Tokyo Quartet’s 1980s recording, which I highly recommend. But that may just be my own duck imprinting. FBR: It feels like there’s a lot of room for future stories in the spectacular setting you created for 2312. Are you planning to write more novels in this setting, and if so, will Swan and Wahram make an appearance? If not, can you already give us a hint of what we can look forward to in your next book? KSR: I am not planning to write any more about those characters or that particular future history. Their story is over, and I’ve got some other ideas to explore, and with luck I will. Next up will be something different, I’m quite excited, but don’t want to talk about it yet, while it’s still up in the air. FBR: Thank you for this interview! This entry was posted in Interviews and tagged Kim Stanley Robinson. Bookmark the permalink. Great interview. I’m excited to pick this one up! I recently read and reviewed Red Mars, and I spoke so glowingly about it that my sci-fi hating wife agreed that it sounded like it might be worth reading. Nice interview. I am two-thirds through the book right now (it is my introduction to KSR). Mars Trilogy will definitely be completed this year. Pingback: 2312 by Kim Stanley Robinson | Vaste programme !